Get into the holiday spirit and let your child experience the magic of Santa without the wait and hustle of the mall. Children will get to meet Santa, ask him questions, and bring them their letters as well as receive a special treat from Mrs. Claus. Have a favorite Christmas book your children love to read? Bring it along so Santa can sign it! Style Inspiration Board, Santa Certificate & special treat from Mrs. Claus included. Santa sessions are for children and siblings only. If you have 5 or more children, you must book 2 spots. TERMS AND CONDITIONS/CANCELLATIONS: Absolutely no refunds will be given, but you may transfer your session to another party or use your credit on file for a future session. CHOSEN IMAGES: The images included in your package are selected at the sole discretion of the photographer. I choose the best images for a collection of 5 images and chooses to edit all keepers, simply discarding blinks, duplicates, etc. I am not responsible for reactions to Santa or a child having various emotions and feelings (and therefor facial expressions) toward Santa. IMAGE DELIVERY: A digital download will be provided within 2 weeks of your Santa session. Babies & children only- no parents. Up to 4 are included (must be siblings). Please schedule 2 slots for more than 4 children. Cousins may schedule two slots together and combine sessions for individual photos and cousins together. SESSION INFORMATION: Each session will last approximately 5-1o minutes, give or take. The reason for this is NOT to rush you, but to get the best out of each child. Some children are fine in just a minute with Santa and some take a few minutes longer. I take however long we need to create a collection of images up to my standards. This may mean 5 minutes or it may mean 10 minutes. Please note that once a baby or child begins crying or melting down, they often are not able to recover, so I do my best to photograph quickly, again not to rush you, but to give them the least amount of anxiety. COPYRIGHT: Petite Magnolia Photography retains all copyright and provides a personal print release with all downloads. Petite Magnolia Photography may use images from Santa sessions for promotional use, both online or in print. RECOMMENDED CLOTHING: Winter/holiday pajamas OR simple clothing with NEUTRAL tones such as creams, grays, whites, browns, and gold/silver. Please no letters or characters, bright/large patterns, or fancy large dresses that will overpower your child and Santa. SIMPLE & NEUTRAL IS ALWAYS BETTER!! Santa will be in red and white set in a field of natural Christmas trees. 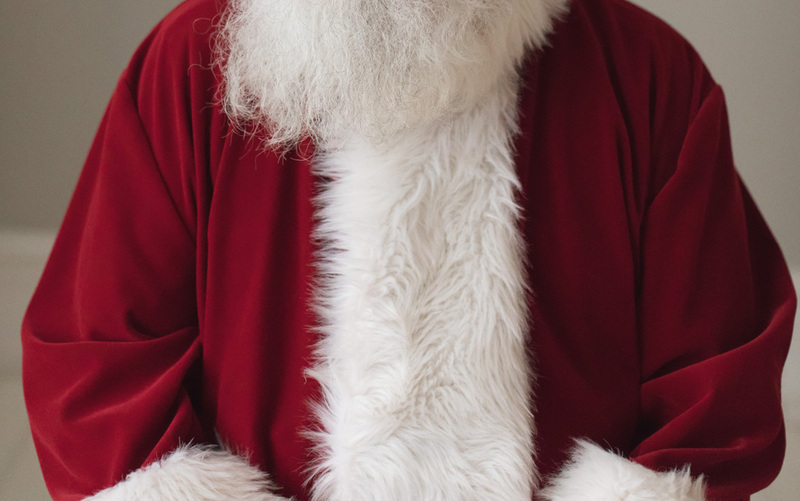 BE PREPARED: Please note that each Santa session is scheduled so that you will have minimal wait time at the farm, but a wait of a few minutes may occur. It’s best to arrive at least 10 minutes before your scheduled time, so you are not rushing. Please plan to spend anywhere from 15-30 minutes total at the farm that day. By finalizing your session/payment you agree to the above terms & conditions.